Koh Sirey (or Siray or indeed Si Ray) is a rather forgotten corner of Phuket, located to the east of Phuket Town, over a small bridge past the Rassada Ferry Terminal (from where you get boats to Phi Phi and Krabi). We first went exploring in Koh Sirey many years ago and it was very quiet. Now there are quite a few "seaview developments" and one big resort - the Westin Siray Bay which opened back in about 2010. This is an updated post which was first blogged back in 2006! I added some newer photos in 2011 and now some even newer 2017 photos! (above) View of the temple from below next to a small klong (canal). 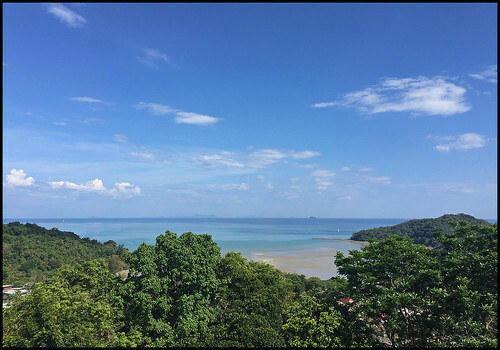 Much of Koh Sirey is undeveloped with lots of rubber plantations, coconut trees, a sea gypsy village, a few big houses, a school, a fair number of locals and a temple on the hill. The temple is just past the school. You pass through an entrance by the road up a slight hill to an open area, turn right and the road carries on up. Not much parking space (park where you like, it is unlikely to be busy) and head up the steps lined by 2 dragons. Inside the main temple building (if it's open) you find a large reclining Buddha. We've been maybe 8 or 9 times over the years. It's really nice but could be amazing with a bit of investment. On a hill, great views, big Buddha .... win! We always leave a donation. 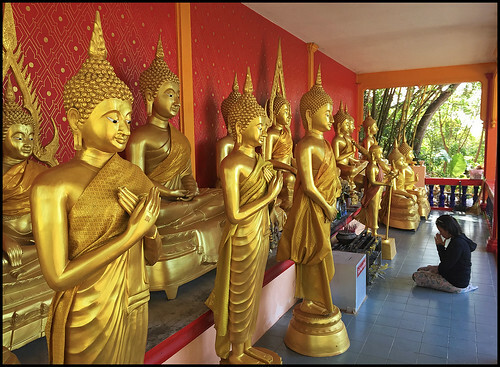 You can also walk around the outside of the temple before climbing the steps - the road winds right around the temple which is surrounded by hundreds of other Buddha images. It's really quite beautiful. And yet every time we have been there have never been more than a handful of visitors. 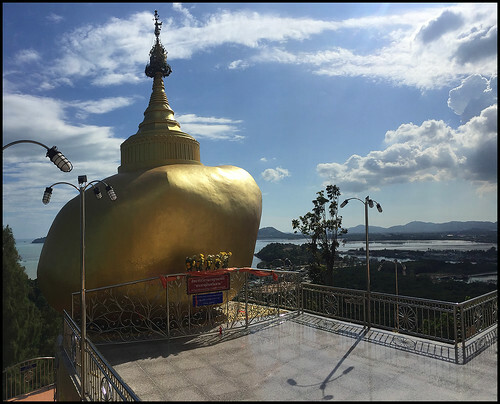 (above) Replica of Kyaiktiyo Pagoda, also known as the Golden Rock. The original is in Myanmar, in Mon state northeast of Yangon. It's one of the most important Buddhist pilgrimage sites in Myanmar. So why is there a replica in Phuket? Well, there are plenty of Myanmar folks living in the area. We saw several Burmese girls visiting while we were there last time. And the views ... 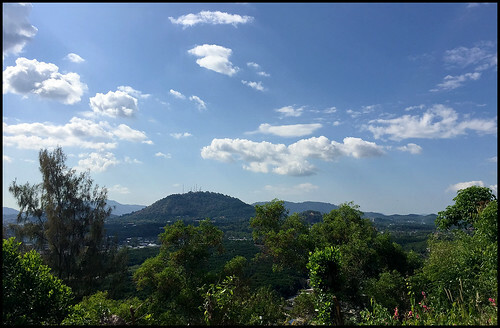 Although the temple does not sit on a big hill (only about 60m above sea level) there are some lovely views all around. 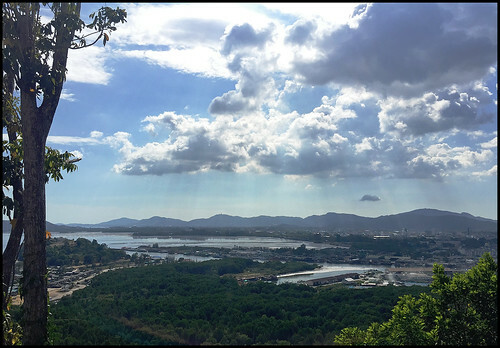 Phuket is full of great views! Certainly worth a visit - Koh Sirey is a few km to the east of Phuket Town, easy to find, but aside from the temple and the views, not a lot here! I'd like to take some photos around the sea gypsy village one day. But the temple is certainly nice, with one of the lesser known Big Buddhas of Phuket!